Well, what do you know? The people who made Crash Bandicoot, Jak & Daxter and Uncharted are now making something terrific-looking called The Last of Us. The trailer for Naughty Dog's new PlayStation 3 game premiered on Saturday. A few details have been trickling out, too. Let's round them up and see what we've got. 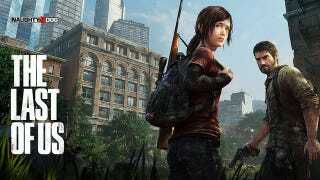 First, we've got an official description from the game's creative director, Neil Druckmann and its game director, Bruce Straley: "The Last of Us is a genre-defining experience that blends survival and action elements to tell a character driven tale about a modern plague decimating mankind," they told Naughty Dog's in-house blogger. "Nature encroaches upon civilization, forcing remaining survivors to kill for food, weapons and whatever they can find. Joel, a ruthless survivor, and Ellie, a brave young teenage girl who is wise beyond her years, must work together to survive their journey across what remains of the United States." This is somewhat familiar ground for Last of Us designer Mark Richard Davies, who previously worked as the lead designer on Namco and Ninja Theory's acclaimed game Enslaved: Odyssey to the West. That 2010 adventure featured a male-female duo racing across a United States that was ravaged by some sort of invaders and overgrown by nature. But Enslaved was more sci-fi than survival-horror and it was far more fantastical. It's leads were Mad Max-looking future soldiers. The Last of Us stars what appears to be an ordinary man and an ordinary teenage girl. The game's trailer was rendered entirely in-engine. These are real video game graphics, if not shot from playable camera angles. The trailer mostly speaks for itself. It doesn't reveal anything about how the game will play, but it does set up its own version of a vivid, green post-apocalypse. As it ends, we hear Ellie make a comment that suggests she doesn't remember a time when people were just "going about their lives" on the ravaged streets of the United States. "It must have been nice," she says. If she's too young to remember the good old days that Joel misses, then the cataclysmic event that transformed the game's world probably took place a dozen or so years before the era in which the game is set. The new game is deep into development. Creative director Druckmann says that he has been working on the game for two years. Elsewhere, Naughty Dog confirmed that it is no longer a one-game-at-a-time studio. The Last of Us has been made in parallel to Uncharted 3. A two-team studio can, in theory, produce a game a year, and that could peg The Last of Us as a 2012 release, but there is no confirmed release year for it yet. There was a teaser for the game in Uncharted 3. Before most people even knew that Naughty Dog was making The Last Of Us, clever gamers found a teaser for the game in Naughty Dog's Uncharted 3. You know, I spent a lot of time looking at the newspaper's in that game's bar. I knew there was something hiding there! Here's a clip in which a gamer explains how Uncharted 3 teases the new game—this clip was put on YouTube one day before Naughty Dog's involvement was revealed. You, like me, may not initially see how that tease actually teases anything. To appreciate it, you have to know that The Last of Us was initially teased through a pair of abstract videos, one that featured a man reminiscing about the good old days while real-life footage of riots and disasters played; the other clip featured an ant. That ant video, IGN reported, was snagged from the BBC documentary Planet Earth, specifically from a section about a parasitic fungus called Cordyceps. This is the BBC Planet Earth footage Naughty Dog used on their Last of Us website, with the original voice-over that was stripped out for the teaser. The idea of a killer, parasitic fungus that controls the movement of its hosts fits with the trailer and description of The Last of Us. After all, we've got the idea of "nature encroach[ing] on civilization" and bad guys in the trailer who look like they've got, well, some sort of fungus bursting from their body. Watch the BBC clip. It's as creepy as it gets. Uh, so the Cordyceps thing is actually really depressing, but in happier news, the game's lead voice actors are Troy Baker, who is also voicing the lead character in next year's BioShock Infinite, and Ashley Johnson, who has not had any major gaming roles but did voice work for Ben 10 and Teen Titans cartoons. It may be too early to confirm this, but Troy Baker may be vying for the video game voice-acting ubiquity of the male lead of Naughty Dog's Uncharted series, Nolan North. We'll be keeping an eye out for more news about Naughty Dog's big new game. Odds are that these people will, too.